Students must learn to work together, express and listen carefully to ideas, integrate information from oral, visual, quantitative, and media sources, evaluate what they hear, use media and visual displays strategically to help achieve communicative purposes, and adapt speech to context and task. From a developmental perspective, this Common Core standard is interwoven with the acquisition of verbal and social skills that are critical for students' success across many contexts. Listening is a crucial aspect of school and life, but it is often expected of students without ever being taught. As a former teacher, school psychologist and licensed counselor, Donna worked with many students whose learning challenges were rooted in an inability to listen effectively, and with couples and families in distress for the same reason. A lesson on listening might begin with how the brain processes the sounds around us. We find that many students and teachers are fascinated by the inner workings of their brains. The process of receiving and decoding spoken words takes place in the auditory cortex, which is the part of the human brain's cerebral cortex that processes auditory input. The auditory cortex is located on both sides of the brain in the upper parts of the temporal lobes. Its job is to receive signals from the ears and to transmit those signals to other parts of the cerebral cortex for decoding sound into meaning. This system is instrumental in both profound and everyday aspects of hearing—from the language development of infants to the appreciation of a stunning symphony. The most common obstacle to effective listening is noise. The classroom can be a cacophony of teacher and students talking, chairs scraping across the floor, papers rustling, pencils dropping, doors opening and closing. While the brain's auditory system is capable of blocking out background noises to focus on specific stimuli, nonetheless all these sounds can be distracting. "Noise" can also arise inside students' minds—a persistent song stuck in one's head, pleasant daydreams, or unpleasant doubts about one's ability to understand a new concept or complete an assignment. The HEAR strategy described below is designed to help students recognize and block out that noise as they devote their attention to listening. Explicit instruction on using the HEAR strategy offers concrete steps to focus on and improve listening—and emphasizes why and how developing this skill is so important. As Michigan teacher Aaron Rohde says, "Just saying that one is going to be a better listener is not enough to make it happen. One must work hard to improve such an essential skill." Halt: Stop whatever else you are doing, end your internal dialogue on other thoughts, and free your mind to pay attention to the person speaking. Anticipate: By looking forward to what the speaker has to say, you are acknowledging that you will likely learn something new and interesting, which will enhance your attention. Replay: Think about what the speaker is saying. Analyze and paraphrase it in your mind or in discussion with the speaker and other classmates. Replaying the information will aid in understanding and remembering what you have learned. Aaron Rohde demonstration the hard work of HEARing. Initially, teachers may need to lead several demonstrations of using the HEAR strategy and remind students when it is time to HEAR, but over time, listening should become more automatic. 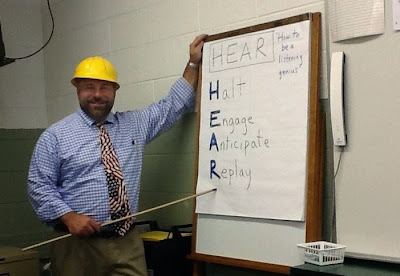 When Mr. Rohde taught this strategy to his third- and fourth-graders last fall, he wore a hardhat to emphasize that learning how to listen well is hard work. But he also tells his students, "Being a 'listening genius' will be beneficial in all areas of life—in school, in personal relationships, and in professional work situations." We wholeheartedly agree! We leave you with three questions. Is teaching cognitive strategies, like effective listening, part of your school's curriculum? What would happen to learning in your classroom if students became more effective listeners? How might you use (with modifications, if necessary) the HEAR strategy in your classroom?